Ben Jones and Vern Tejas led our 2018/19 season with all teams reaching the summit and followed our 100% success of the 2017/18 season. For the 2019/20 season Ben and Vern will each lead two trips. 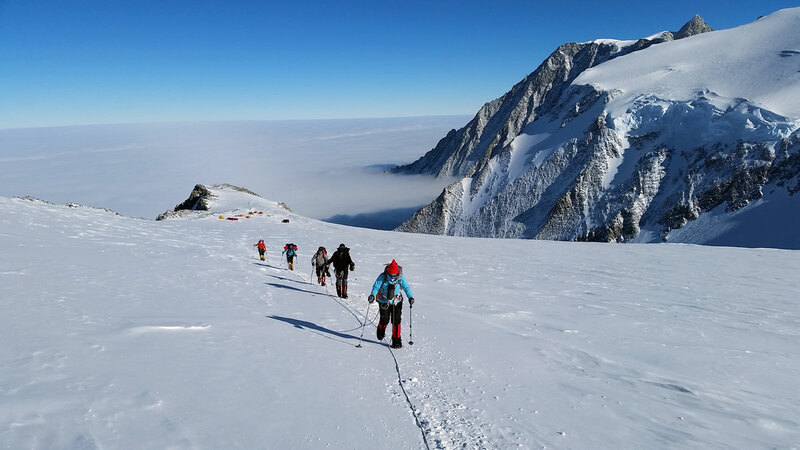 Our history on Vinson is long and rich, beginning with our commercial expeditions in 1992 (indeed, there were some commercial flights back then), Alpine Ascents has led and cultivated Mt. Vinson climbing practices along with our flight service partners. 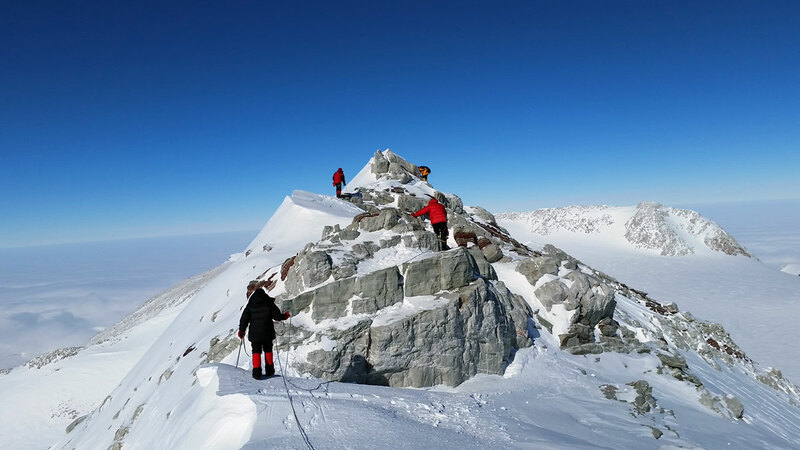 With nearly 100% success over these past 20 years, we have developed logistics, environmental procedures, climbing routes, camps, and communication protocols that have helped facilitate our high summit and excellent safety record. While items such as extra days on the mountain and satellite phones have become standard practice, our experience in number of seasons and in trip logistics is unsurpassed. Alpine Ascents’ ability to lead multiple trips per season puts us in position to adjust to changing conditions and have the resources available that a one-guide, single expedition does not have. As always, we encourage you to ask questions of Alpine Ascents and other guide services before embarking on an expedition of this magnitude. Please remember you are part of a climbing team and, as with any team, your ability to contribute not only helps your chances for success, but also mitigates some of the climbing risks and increases the likelihood of a highly enjoyable experience for all. Our office is at your disposal to discuss training, gear, prerequisites, and logistics. You may want to check out our Training regimen, as this will also serve as excellent preparation for Vinson. We strive to provide a balanced diet while on the continent of Antarctica. This includes time spent at Union Glacier Camp and time spent on Mt. Vinson during the climb. The breakfasts usually consist of eggs, pancakes, oatmeal, and some cereals, along with a hot drink. Dinners usually consist of a carbohydrate, a vegetable, and meat. Examples are rice, pasta, mixed vegetables, chicken, fish, or beef. Our hot drinks selection consists of hot cocoa, apple cider, tea, and coffee. It’s a long way to Antarctica, and making the pre-trip planning as easy as possible makes for one less worry for the climber. We pride ourselves on being available for your phone calls and emails, and we have a 24-hour emergency number. We prepare the necessary documents in a clean and precise manner. We are happy to walk you through our application forms, bios, necessary insurance, and flight service paperwork. We can discuss and help plan training regimens (catered to where you live) and work closely with you on locating the right gear and discussing clothing options. We have an excellent travel agent who can get you out of Punta Arenas as quickly as possible with 24-hour call service. Our guides will personally contact you before your climb. Those wishing to embark on this unique journey should possess previously established climbing skills and be prepared for harsh conditions of extreme cold and, at times, ferocious winds. Climbers must be in strong physical condition and be able to carry 45 lbs. Mountaineering skills required include: self-arrest, glacier travel, and crevasse rescue. Climbers should have successfully completed at least a week-long training course, as well as some other climbs such as glaciated peaks in Washington State or Alaska. Climbers also need to be skilled at personal maintenance and hygiene. This is more than just having the right gear, but a sense of one’s working body, an ability to detect cold and other issues, and a willingness to communicate your level of health with your guide. Should we believe that the unexplored exists, then we must view the isolation of Antarctica as an explorer’s final frontier. Unparalleled in its pristine and absolute beauty, the journey to the Antarctic continent and the climb of Mt. Vinson ignites man’s primal instincts for wilderness, the elements, and conquest. The sheer magnitude of the continent and the exquisite nature of the ascent is an extreme and remarkable experience. Mt. Vinson, located 600 miles from the South Pole and 1,200 miles from the northern tip of the Antarctic Peninsula, is the highest peak on the continent. Vinson is part of the Ellsworth Mountains, which rise majestically from the Ronne Ice Shelf. Obviously unique in location, Vinson presents more than an off-the-beaten-track climbing trip. The entire journey is surreal in texture; from the land’s-end departure point of Punta Arenas to the five-hour flight to a continent with no permanent inhabitants, and to the Union Glacier Camp amidst the giant arctic desert. 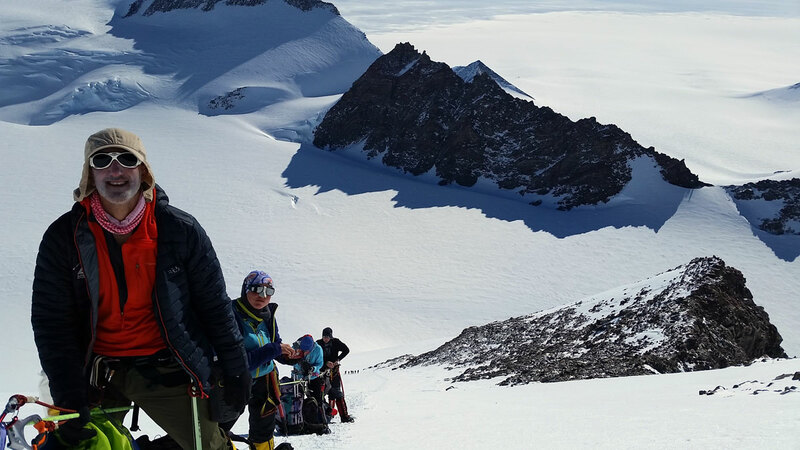 While it may be inclusion in the Seven Summits that spurs the initial attraction, most climbers find Vinson to be one of their most memorable climbing experiences and a chance to capture once-in-a-lifetime images. The climb of Mt. Vinson is moderate by technical standards. It is similar to other alpine routes, with its moderate slopes and glaciated terrain. 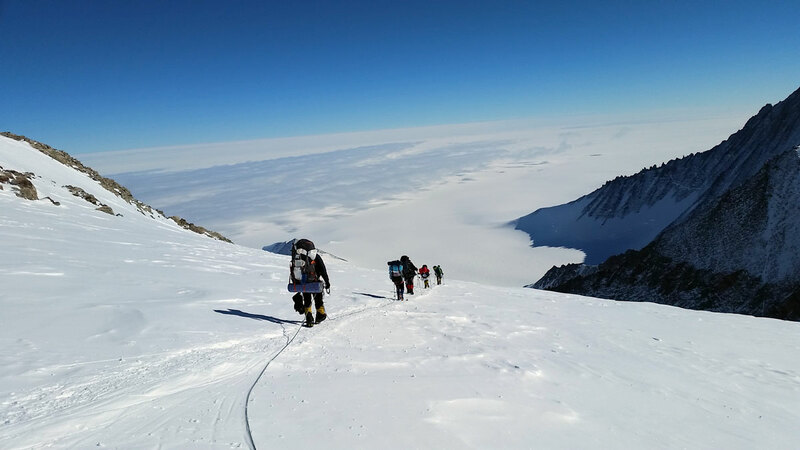 What separates Vinson from all other peaks is the sheer isolation of the mountain and the extraordinary views from its summit. As we approach the top of this remote continent, we peer across thousands of square miles of ice caps and glaciers that fade into a distinctly curved horizon. From the summit, we are blessed with views of neighboring Mt. Tyree, Shinn, and Epperly, and a multitude of unexplored peaks. The climate on Vinson is generally controlled by the polar ice cap’s high-pressure system, creating predominantly stable conditions. But, as in any polar climate, high winds and snowfall are possible. 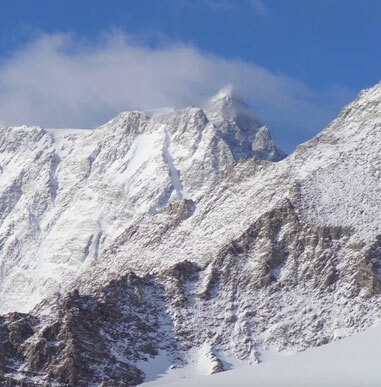 Though the annual snowfall on Vinson is low, high winds can cause Base Camp accumulations of up to 18 inches in a year. During the summer season (November through January), there are 24 hours of sunlight. While the average temperature during these months is minus 20 degrees F, the intense sun will melt snow on dark objects. As of 2010, a new runway and camp has been established at the Union Glacier (replacing the Patriot Hills camp), and has led to a lower rate of flight delays. Climbers need to be prepared to travel in extreme cold environments, and be properly geared and skilled in self-care. Between our low camp and High Camp on Mt. Vinson is a section that involves climbing with the assistance of a fixed line. The elevation gain is roughly 1,800 ft. and it takes several hours to ascend this section. The slope angle does not surpass 40 degrees and is best climbed with crampons, ice axe, and the use of an ascender. The fixed lines are regularly maintained and are constructed of high-quality climbing ropes and anchors. We take breaks regularly during this portion of the climb, as we do for the entire expedition. With 5.5 million square miles of solid ice, the mass of this continent — twice the size of Australia — creates a remote wilderness unrivaled on the planet. While the size of the continent expands and contracts with seasons, the topography remains stunning with natural sculptures finely crafted by the barrage of wind, snow and cold. It is this ice age environment that constantly attracts intrepid travelers and explorers. While Antarctica has no native population, Emilio Palma (Argentinean) was the first to be born on the continent in January 1978. The lowest temperature recorded by a thermomenter on Earth was minus 128.6 degrees F at Vostok Research Station on July 21, 1983. Though not considered “official,” a NASA satellite measured a temperature of minus 135.3 degrees F in east Antarctica in 2010. With less than two inches of precipitation per year, Antarctica is best characterized as a desert. Antarctica currently has a number of permanent research stations supported by several cooperating nations. It was nearly 200 years after James Cook circumnavigated Antarctica that the summit of Mt. Vinson was reached (1966). It was the last of the Seven Summits to be conquered. The American Alpine Club and the National Geographic Society sponsored an American team which summited Mt. Vinson two weeks after their arrival, on December 17, 1966. 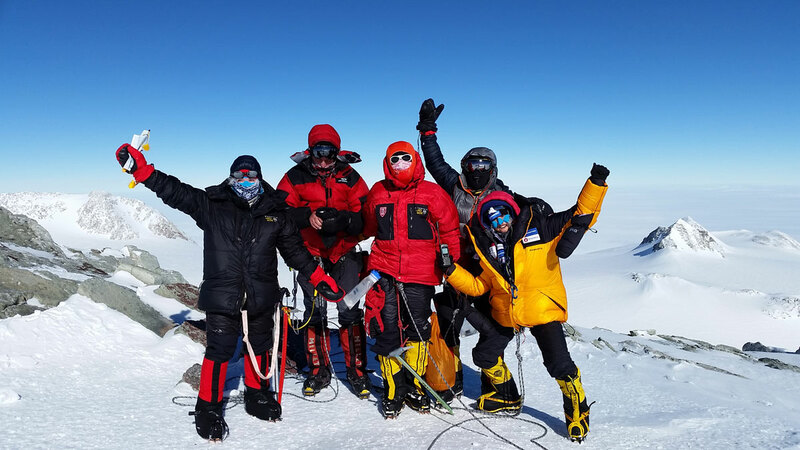 The team, led by Nicholas B. Clinch, remained about a month on the continent and summited a number of peaks, including the extremely technical Tyree, as well as Shinn and Gardner. This expedition is well-documented in the June 1967 National Geographic Magazine. Soon after their return, US policy encouraging travel to Antarctica was changed to discourage travel to this region. Those wishing to embark on this unique journey should possess prior climbing skills and be prepared for harsh conditions of extreme cold and, at times, ferocious winds. Climbers must be in strong physical condition and be able to carry 65 lbs. 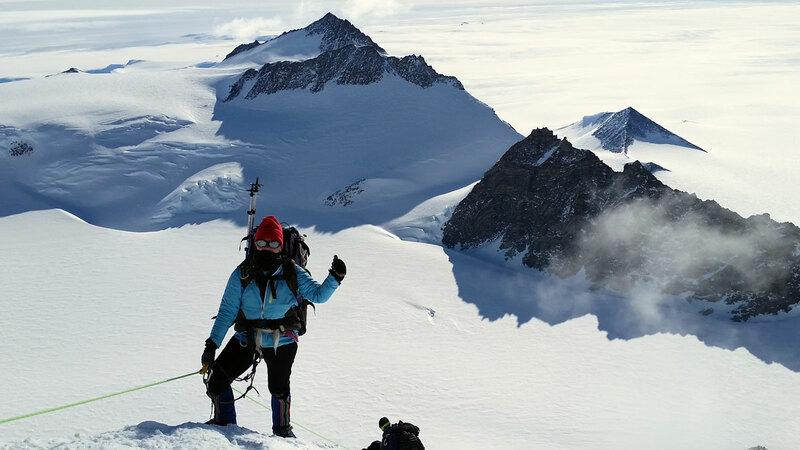 Mountaineering skills required include self-arrest, glacier travel, and crevasse rescue. Climbers should have successfully completed at least a week-long training course as well as completed some other climbs, such as glaciated peaks in Washington State or Alaska. In addition, climbers need to be well-skilled at personal maintenance and hygiene. This is more than just having the right gear, but a sense of one’s working body, ability to detect cold and other issues, and be willing to communicate your level of health with your guide. Vinson at 16,067 ft. is an extreme, high-altitude climb. You should be comfortable climbing eight hours per day. Summit day is the most demanding portion of the climb, typically involving eight hours for the ascent and three to five hours for the descent. Be prepared to carry a 45-lb. pack, but weight may be substantially lighter when we use sleds. Generally you carry 35 lbs. in a backpack and 25 lbs. on a sled. Along with the required climbing skills, review cardio training on the Vinson Training guide. We strongly recommend following the advice of our guides to acclimatize properly. We have nearly 100% success on this climb. Your expedition leader will be one of our senior mountain guides. They will have along as many assistant guides as necessary to ensure a low climber-to-guide ratio. Usually 5:1 or less. This year’s guides include Vernon Tejas, Michael Horst, and Garret Madison. Late November until the end of January is prime season. Yes, we generally use two-person tents and sometimes three-person tents at High Camp. Be prepared to carry a 45-lb. pack but weight may be substantially lighter when we use sleds. Generally you carry 30 lbs. in a backpack and 25 lbs. on a sled. Those requesting rental gear must submit an expedition rental form with payment by credit card. All rental gear will be mailed to the climber prior to the climb. Climbers are expected to clean all rental gear and return it to us by mail following the expedition. While it is impossible for us to list all brands for certain gear, we do offer a wide variety of equipment in our Gear Shop that has been handpicked by our staff of mountaineering experts. Please feel free to call our offices with any gear questions or substitutes. Plastic boots or triple boots are required for this climb. All water is boiled or treated. 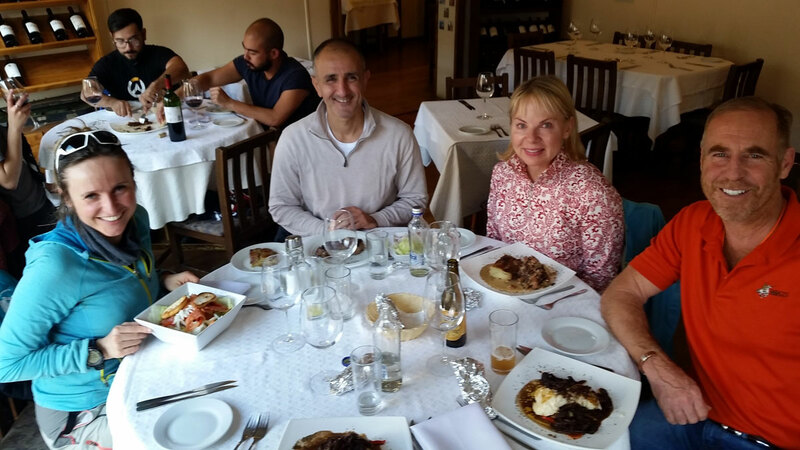 Meals in the mountains consist of a diet rich in carbohydrates because our bodies do not process fat and protein efficiently at higher elevations, and climbers will need to compensate for the increase in caloric need that high-altitude climbing involves. This trip features a classic mix of climbing food and prepared meals. As we ship and purchase all our own food, meals tend to be surprisingly good. You may bring power bars, Gu, Power Gel, cereal bars or similar high energy foods. Powder Gatorade is also recommended to fight dehydration. All meals will be provided on this expedition. Climbers generally fly via Santiago, Chile onward to Punta Arenas, Chile. Climbers that arrive early or depart late will incur in an additional airport pick up fee. An Alpine staff member or representative will pick you up at the airport in Punta Arenas. Look for a smile and an Alpine Ascents logo. We are happy to make arrangements such as personalized tours, extra hotels rooms, airport pick-ups, and arrange for private rooms. Please indicate that you would like a private room on your application and we will contact you with information on single room supplement costs (for hotels only). Climbers pay for their hotel rooms until departure to the Antarctic continent. None at this time. There is a $160 entrance fee to Punta Arenas, Chile. Guides will carry satellite phones but these are generally not for personal use. You can always call our offices and we will have our Vinson lead guide contact you. Thirty days prior to departure, we will mail a list of the other team members to you. Difficult to say as we can be delayed before flying to Antarctica. Fortunately, one can use credit cards for meals and hotel rooms. As there are only lead guides (as opposed to trips with local support) tipping is at the discretion of the climber but please feel free to contact us for guidelines. You may call our offices with a credit card or mail/fax an application with a check or credit card number or register online. We accept MasterCard, Visa, American Express, personal checks, and Alpine Ascents gift certificates. To reserve a space the deposit is $5,000.00 and balances are due 120 days prior to departure. Unpaid balances can result in forfeiture of trip. Leaving the trip early is difficult given the remoteness of the continent. All climbers will be directed towards purchasing evacuation insurance for those situations. Alpine Ascents now offers the opportunity for climbers and adventurers to ski from the 89th degree to the 90th degree at the South Pole. This incredible journey was once reserved for explorers on lengthy expeditions but is now accessible via this unique guided trip. We travel by ski-equipped aircraft to the 89th degree. From that point, we ski the final length, 60 nautical miles, across windswept terrain and sastrugi in an effort to reach the geographic South Pole. This trip takes approximately 10 days. You will have hearty meals and snacks along the way, and a comfortable camp each evening to enjoy a group supper prepared by our guides. 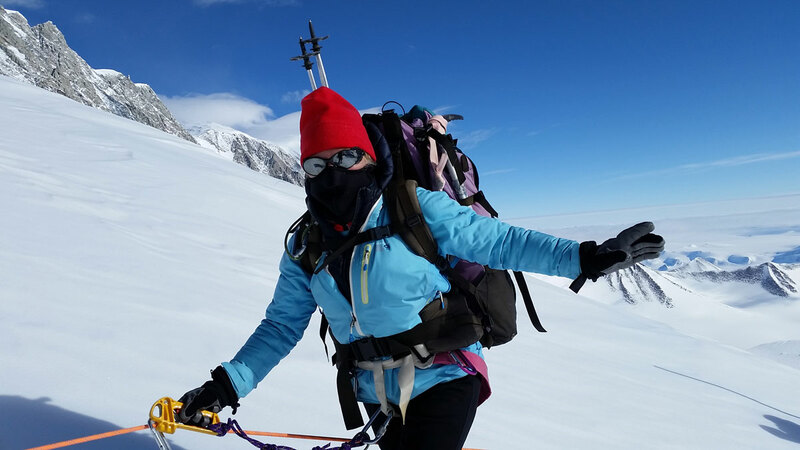 The prerequisite for any adventurer considering the South Pole ski trip is good physical condition and moderate randonee (cross-country) skiing skills. An extremely small number of tourists have visited the South Pole, allowing you to figuratively make a historical crossing. Reach the geographic South Pole and realize that you are now standing at the most southerly point on Earth where, beneath your feet, 360 lines of longitude collide and the ice is almost 3,000 m (10,000 ft.) thick. This journey can be made independently or in conjunction with our Mt. Vinson climb. Day 1: Depart your country of origin. Day 2: Arrive Punta Arenas, Chile. Day 3: Slide Show, gear weighing, city exploration. In the morning you are invited to join us for an Antarctic slide show and lecture conducted by ALE. The lecture includes information on your flight South, the current weather situation and what to expect on your arrival in Antarctica. We will also be weighing gear as all gear that will fly to the glacier will be checked in at this time. There is time for questions and meeting your fellow travelers. After that, you are free to explore the city. Fly 4.25 hrs to Antarctica by private transport jet. 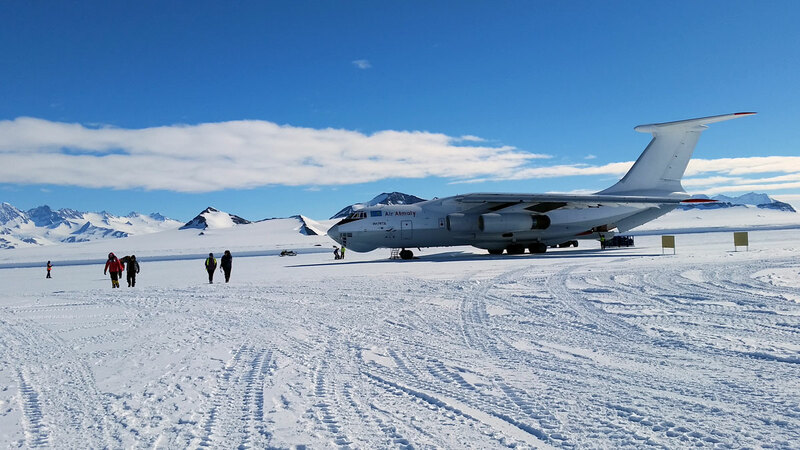 Transfer to ski aircraft and continue to Vinson Base Camp at 6,900 ft (2100m) on the Branscomb Glacier. Today is an easy day to acclimatize to Antarctic conditions and become familiar with expedition equipment. We will review expedition logistics with our guide, go for a scenic ski and prepare for our mini-expedition. We get our first taste of sled hauling with an overnight mini-expedition. 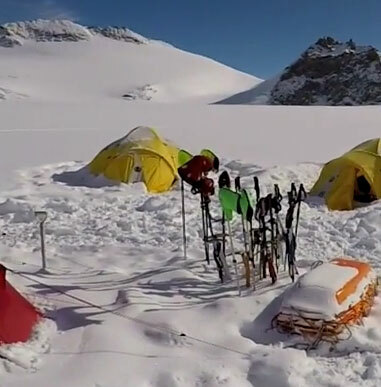 We will make several marches and set a field camp on the Union Glacier. This gives us an opportunity to practice pacing and navigation, and to fine tune our clothing and camping systems before heading into the deep field. The next morning we return to base camp. We fly by ski aircraft to 89°S, 60 nautical miles from the South Pole. As the aircraft disappears from view, we are struck by the stark beauty and emptiness of this place. There is nothing but snow and wide horizons in all directions. 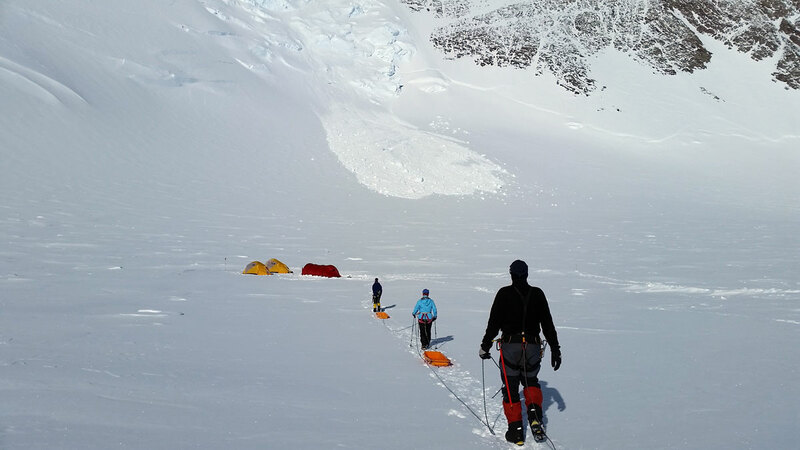 We ski a short distance, or camp at our drop-off point to acclimatize to the extreme cold and altitude. We begin our trek south, a self-sufficient team ‘man-hauling’ all of our equipment and supplies. We start slowly to acclimatize, gradually increasing our travel-time to about 8 hours a day. The journey is physically demanding. Our sleds weigh approximately 66lb (30kg) and the snow may be sculpted by the wind into steep ridges called “sastrugi”, adding to the challenge. As on all expeditions, success is a team effort. The group will travel together and participants will be expected to help set up camp and prepare meals at the end of the day. The Amundsen-Scott research station will be visible from about 15 miles (24km) out – those last few miles can seem the longest! 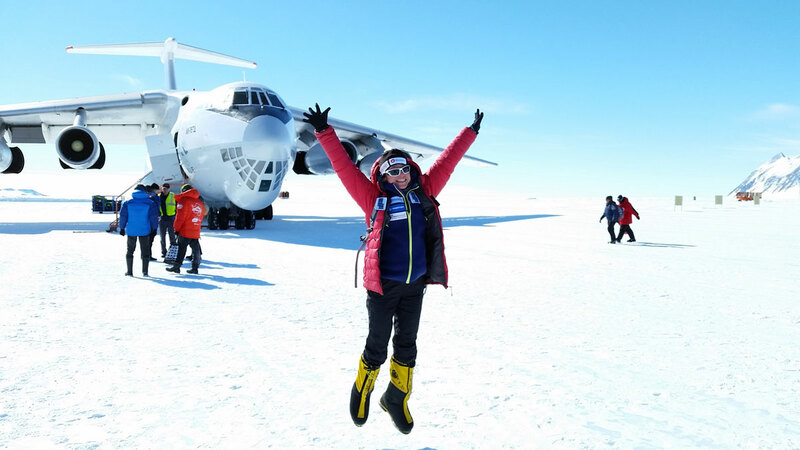 Today we complete the final steps to our goal – the Geographic South Pole – and the most southerly point on Earth. Feel the satisfaction of having arrived here through your own effort and reflect on how it must have felt to stand in this place one hundred years ago, with only the sound of the wind and an endless expanse of white stretching northward in all directions. We will set up camp in the designated camping area while waiting for our pick-up by ANI ski aircraft. The South Pole has been designated as an Antarctic Specially Managed Area (ASMA #5) to conserve the environmental, scientific and historical values of the area. We ask for your cooperation in respecting visitor guidelines during any time we may spend at the South Pole. The completion of this incredible journey will be the return flight to Union Glacier over the polar plateau. Once back at Union Glacier Camp we will enjoy a celebration dinner and toast our wonderful achievement. We have journeyed overland to the Pole, joining an elite group who have challenged the ‘real Antarctica’ of polar explorers. At camp you can rest and recover from the expedition, or take part in excursions and activities that will be going on around camp. The choice is yours. Continue on to join Mount Vinson team or fly back to Punta Arenas. Note: Every effort will be made to follow the above itinerary, but it is subject to change at the discretion of our staff, based on weather and local conditions. Some departures may be slightly longer or shorter based on flight schedules to Antarctica. If you are interested in extending your trip to include the South Pole Ski Tour or flight to visit the South Pole, email our director of programs, Gordon Janow, at gjanow@alpineascents.com. 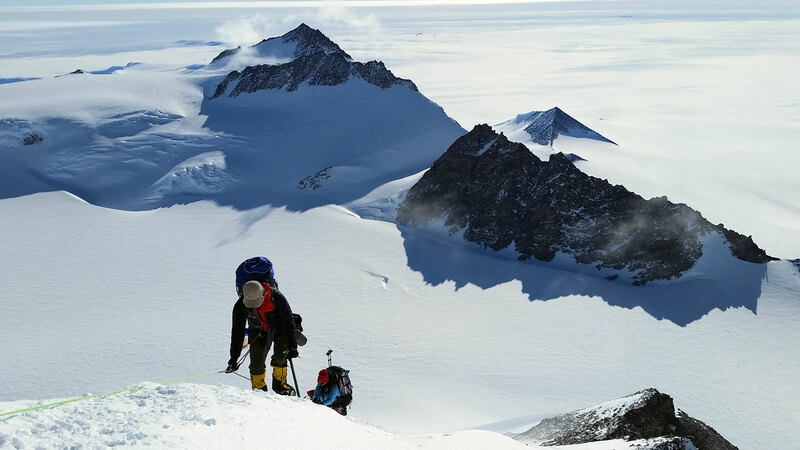 Alpine Ascents is deeply committed to maintaining ecosystems at home and around the world, especially in the pristine environment of Antarctica where biosecurity is paramount. With each expedition, trek, and course, we not only attempt to leave the environment as we found it, but strive to assist the local population in protecting the land and people indigenous to that region. Alpine Ascents reaches for the highest ethical business practices at home and abroad. Each staff member is dedicated to environmentally sound alpine ascents. At Alpine Ascents, environmental stewardship remains one of our core values and we take Leave No Trace ethics and practices very seriously. The mountains are our home and we are unwilling to sacrifice their preservation for human objectives. On every one of our courses and climbs we teach and follow the environmentally appropriate Leave No Trace principles and practices. 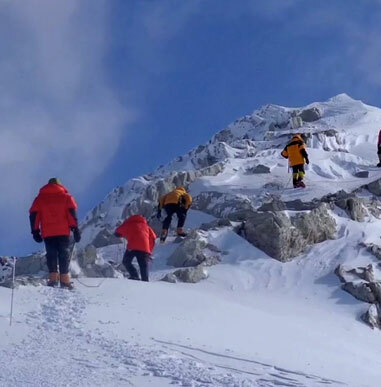 Over the years, with the assistance of our Sherpa teams, we have stepped up efforts to clean Mt. Everest. Our Wag Bag® program made a pioneering step in human waste management for the National Park System and Forest Service in the North Cascades. On Aconcagua and Vinson, we pioneered a waste removal system on our climbs, utilizing the WAG Bag® system. And we continue our on-going maintenance and minimal impact plans wherever we guide. We believe that given the proper information most people will do all they can to help protect and maintain the environment. Alpine Ascents is committed to developing safe, self-reliant, and environmentally conscious mountaineers. Superb trip – very good food, a nice surprise at the end – a turquoise soft shell jacket – I like it very much and the guides were great, thank you!